Get the most out your time behind the wheel with a great looking steering wheel from Grant. With many steering wheels to choose from, including hand-polished wood wheels, banjo-style wheels, classic foam wheels, chain-grip wheels, and more, you're sure to find a Grant steering wheel to complement your vehicle, as well as installation kits, horn buttons, shift knobs, and more. 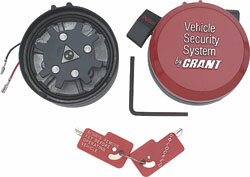 The steering wheel horn buttons are optional for the Grant Classic Series steering wheels. This is a matte black smooth steel cap. Will only fit Grant Classic Series wheels. This horn button is optional for the Grant Classic Series steering wheels. This horn cap features a chrome steel cap with a silver bow tie logo on blue background insert. Will only fit Grant Classic Series wheels..
Great tool to have when replacing your OEM or replacement steering wheel. Allows for easy removal, can be used for almost any model and includes instructions. The horn button is optional for the Grant Classic Series steering wheels. This horn cap features a smooth chrome steel finish. Will only fit Grant Classic Series wheels. This horn button is optional for the Grant Classic Series steering wheels. This horn cap features a chromed steel cap with a Chevy crossed flags logo insert. Will only fit Grant Classic Series wheels. The horn buttons is optional for the Grant Classic Series steering wheels. This is a chrome steel cap with a SS logo insert. Will only fit Grant Classic Series wheels.